Now Itoigawa Has a Smartphone App! 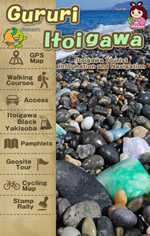 Gururi Itoigawa is your new travelling companion when visiting Itoigawa and the Itoigawa UNESCO Global Geopark. With detailed information about restaurants and bars, hotels, popular tourist sites and more, Gururi Itoigawa will help you make the best out of your visit! Download it for free for iOS or Android from the App Store or Google Play today! ・Share your experience on Twitter or Facebook!